... 1992 (20 years ago today), were announced the results of a late-September election, conducted under the supervision of the United Nations in accordance with 1991 peace accords that had brought a stop to a protracted civil war in Angola. More than 91% of registered voters took part. The party of incumbent President José Eduardo dos Santos had won nearly 54% of the votes for the legislature, but neither he nor his challenger, UNITA rebel leader Jonas Savimbi, had garnered 50% of the presidential vote. 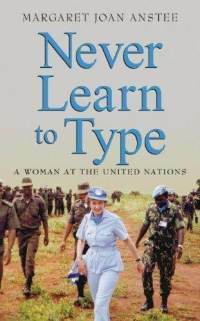 Margaret Joan Anstee of Britain, the Special Representative of the U.N. Secretary-General (a U.N. careerist who published the memoirs at right a few years back, brilliantly titled Never Learn to Type: A Woman at the United Nations), declared the vote "to have been generally free and fair." Yet Savimbi's UNITA responded with "a nationwide operation to occupy municipalities by force and remove the Government’s local administrative structures"; by month's end, "heavy fighting" had erupted. It would be years more before a new accord brought peace to the country.